The village of Stephani is built amphitheatrically on the harsh and rocky slopes of Mt. Trahoni, situated on the mountain ridge of Homeric Tretos on the present day borders between the prefectures of Corinthia and Argolis. Perched at a height of 830m the village enjoys commanding views over its small, fertile valley, the historic city of Nauplia, the blue waters of the Argosaronic gulf and some of its islands, as well as the mountain chains of the eastern and central Peloponnese. The village is organised according to the standards of Greek mountain settlements. Built on the southern slopes of the mountain, in order to have favourable climate conditions, it neighbours the fields and pasturelands that provide the basics for survival. The location is difficult to access and well protected between the mountains that form the historic passes of Dervenakia and Aghionori (also called Kontoporeia), which connect the Corinthia with the interior of the Peloponnese since ancient times and are better known today as the site where one of the most famous battles of the Greek Revolution took place in 1822. The landscape seems windswept and extremely bare- especially in summer. Nevertheless the harsh beauty of this secluded and imposing place is captivating. Here nature seems to have remained unaltered since the times of the realm of the "rich in gold" mighty Mycenae, the legendary home of the Atreides, situated only a few kilometres SW of Stephani. A primeval almost metaphysical sensation impels you to imagine the men and women who have lived, fought and prayed on this land through the ages. Every stone seems to be a silent witness of history. Legend has it that the Stephanians are the descendants of the Myceneans, who are said to have taken refuge to the surrounding mountains, after the invasion of the Dorians in 1104 B.C., which summoned the end of the Mycenean kingdom, known back then with the name of «Ahighiava» (also transliterated as "Ahhijawa" and "Achijawa"). Stephani is home to important Byzantine monuments which refer to the many centuries of christian history of the upland situated between the village of Stephani and the medieval village of Aghionori. Worth mentioning is the katholikon of the Old Monastery dedicated to Taxiarhis Mihail (Archangel Michael) that dates back to the 12th-13th century AD, decorated with wall frescoes by Theodosios Kakavas (1565). The church, situated in the depths of an almost inaccessible ravine surrounded by enchanting nature, is one of the oldest monuments of the greater area. The monastery of Stephanion, dedicated to the great martyr Aghios Dimitrios, has been continuing the regions' monastic tradition for approximately six centuries now. Throughout the year the monastery is visited by many pilgrims, especially during its annual celebration on October 26th. On the nearby hill of «Dragatoura» west of the village, rises the Stephanion Observatory, which has been operating since the late 60s. Due to the important observational research undertaken with the 30inch Cassegrain telescope over the past 35 years by the scientific staff of the Aristotle University of Thessaloniki, the Stephanion Observatory is considered to be one of the leading astrophysical observatories world-wide in the field of stellar activity (flare stars). The location for the observatory was chosen very carefully: The region of the Argolis and the Corinthia is considered to be the most suitable region for the installation of observational instruments on mainland Greece, with an average of 200 unclouded nights per year. 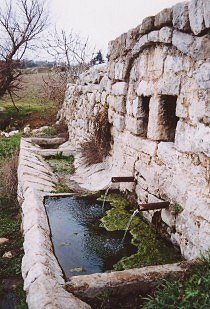 Old stone houses, watermills, olive presses, fountains, stone wells and countless dry stone walls, all samples of the traditional rural architecture of our ancestors and significant part of our cultural heritage, complete the unique symphony of our village. Watching the sun rise above the Mt. Arahnaion in the East is a unique experience, while the view from the surrounding mountaintops of Psili Rahi and Prophetes Ilias is breathtaking to say the least. Stephani is a magical place, that invites you to walk on the paths of nature and history, to reach for the stars, to worship at forgotten monasteries, to admire rare sceneries. But above all it offers the opportunity to connect with our emotional and spiritual side and to discover new meaning and beauty in the world around us.